The issue is that your code is only using the 2D noise to generate height data. To have more complex terrain like one you give as exemple, you will need to use 3D noise generation to create "density" data. And with this you should then be able to generate the cubes. To simplify the idea : instead of cube.pos.y = noise(x, z) do : if (noise(x,y,z) > 0.5) placeCube . 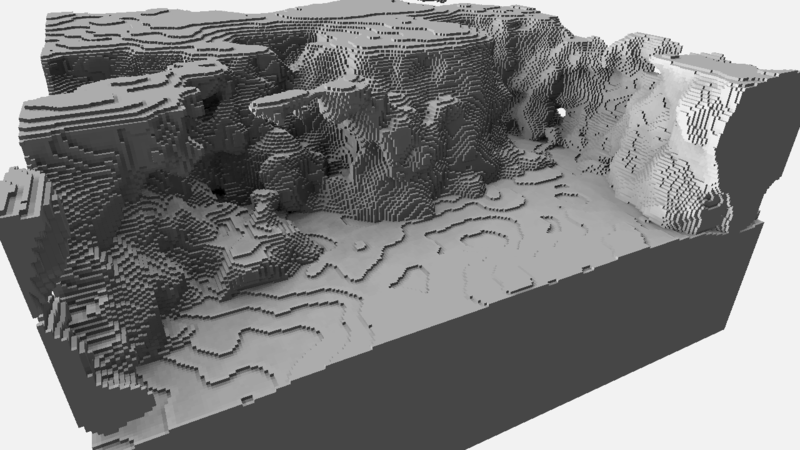 First off, you really got to understand how voxel data is managed. You could easily describe a voxel as the three dimensional pendant to a pixel. When working with heightmaps (=pixel data), your height is stored in a two dimensional surface, (most likely a heightmap texture) where you can recieve an Y value for each two dimensional X/Z coordinate on your map. You can fill that data using a 3D Noise function. I found this implementation of simplex noise earlier, maybe it can help you. Also note that using any of the higher methods will make you generate cubes everywhere your volume function returns true. Doing this is highly non-optimal, as most of those cubes will not be visible because they will be surrounded by others. In games like minecraft and cubework, the generated terrain is not composed of cubes spawn everywhere but of quad faces that only represent the surface of the volume. It's maybe a little soon to talk about this optimisation, but keep it in mind. I totally agree Remy ;) There are big performance issues in this solution but I think for Klasmic it's to early to start building his own polygonization algorythm, he's at a point where he's spawning "chunkY"-blocks in exactly the same position ;D There is a lot more steps he's going to walk through working on that project before he actually can start optimizing anything. My advice from the experiences I gathered so far (e.g. I implemented the TransVoxel algorithm in C# lately) is to take your time and truely understand what you are doing because everything else will very likely end up in a giant, inperformant mess at some point forcing you to refactor and rewrite a lot of code.